Philip runs the family farm in west Herefordshire. The farm specialises in herbage, cereal and vining pea seed production and has a herd of single suckler beef cattle. Philip's wife Heather runs a mail order Birdseed (all supplied and packed by the farm) and ancillaries business, Wiggly Wigglers together with a mail order florist, The Great British Florist, supplying UK grown flowers only, some of which are grown on the farm. 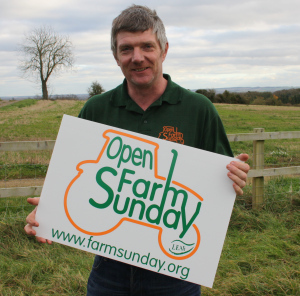 The farm has held a number of open days including Open Farm Sunday in the past and Philip is the OFS regional co-ordinator for the West Midlands. As signs of Spring just start to appear and the days lengthen, the decision to register the farm for OFS2018 can feel something of a challenge. Farms rarely look their best at this time of year and mine is no exception. However, starting to plan the day and put my thoughts in order tends to soon combat the doubts. For me, collaboration is probably the key tool in clarifying what needs addressing and how. By talking to other farmers and friends, some of whom have opened their farm successfully before, my confidence is soon restored. My perception that everyone else’s farms are brand new, perfectly manicured examples of model farmyards is soon dispelled. 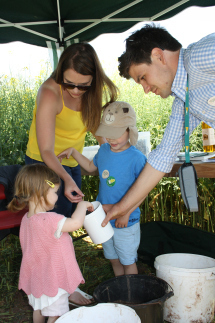 Farms come in all shapes and sizes and the vast majority are, with some basic planning, entirely suitable for a public visit. In my experience as a Local co-ordinator, the two most common anxieties seem to be Health & Safety and ‘Will I be overwhelmed with visitors?’. 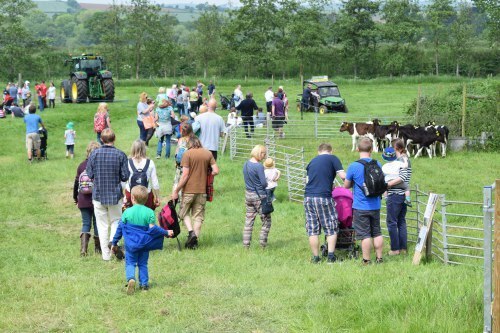 I have found it very helpful to be reminded that LEAF Open Farm Sunday is an opportunity for the public to visit my farm on my terms rather than theirs. Although it is important to keep them safe, we all have areas that either we would rather they don’t see or we feel are impossible to make safe. Here my ‘in stock’ spare machinery, (some may say scrap) is unsightly and potentially hazardous if people had access to it. My chemical shed and workshop are not ideal and my concrete yard should have been completely resurfaced ten years ago. However, it is perfectly acceptable to restrict the areas that our visitors have access to. I have found that they are not necessarily expecting the ‘brochure’ farmyard and are very keen to hear my story about my farm. They fully realise it is a working environment, not designed in the first instance for public access. I also find the impetus that Open Farm Sunday gives me to instigate some tidying up is a positive one. I tend to get used to a pile of plastic string waiting to be collected, etc. I also have found that while the farm can look a bit glum at the end of February, by June it is green and hopefully with a sunny day, the whole outlook is changed. In my experience, some time and thought is very well spent in planning food, hygiene and the order in which people are directed around the farm. The guidelines provided by LEAF make this easy and inexpensive. Again, I have found collaboration to be key by getting the local WI to provide teas and cake for charity, I fully complied with legislation and raised some money for a local good cause. Engaging friends and neighbours to help with parking, contingency plans and so forth all help to spread my workload on the day. In terms of the fear of being overwhelmed with visitors, I talked to other host farmers and OFS staff and found their knowledge and experience invaluable. Once I had got my head around the different levels of promotion and the likely visitor numbers they would generate, personally I was a lot happier. I was able to arrange contingencies for parking and traffic to give me a reasonable margin of error and talking to others, reminded me that problems in this area are extremely rare and really only apply to TV celebrities! My insurance company (in my case NFUMutual) were very supportive and also had a wealth of helpful info and indeed the vast majority of our suppliers and contacts were keen to help and offer advice and experience. Overall, my main piece of advice is to give yourself time and space to enjoy the experience. By accepting help from others, I found I thoroughly enjoyed telling my own story to people who were fascinated by my world without having to worry whether the cake had run out or someone had mislaid their car keys!